When Finding Audrey was first exposed to the world, I was ecstatic ! The cover is insanely genius ! The greenish turquoise colour is so beautiful ! 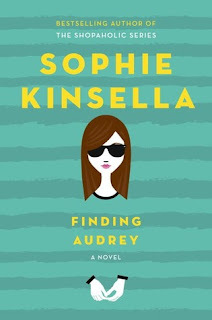 If this hasn’t been Kinsella’s book, I would still buy it and make it one of my cover-buy-books. Finding Audrey is about a 14yo girl named Audrey who suffers from an anxiety disorder caused by a tragic experience in her school. 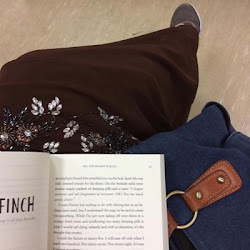 Anxiety disorder or any disorder at all in YA books are often being portrayed as a dark topic. Like the one who suffers from it will be an emotional, depressed and a brooding character with all their dark and deep thoughts but not Audrey. And that is very very refreshing. By the time the book started, Audrey is already in a recovery state and she has had a few sessions with her therapist. She still has her episodes but she faces and controls them with maturity. And she knows how to have a good laugh ! And then comes her family. Audrey’s family is insanely chaotic ! I don’t think chaotic even covers it. Her mom is crazy and obsessed and loud and from a growing teenager’s view aka ME, she is VERY VERY irritating. I’m so thankful that shes not my mom. Honest to God, I cant stand her ! But I really really like her older brother, Frank. Hes my favourite character here. Often in YA and NA books where there is siblings relation involved, the older brother is either too annoying and doesn’t care about his other siblings or too protective, too funny, too dreamy etc etc which make it seems unreal. Frank and Audrey’s relationship is very normal. He seems very teenagerish (considering hes only 15) but he gives enough of the older brother vibe. He supports Audrey and he is very very witty and funny ! "You teenagers need sleep. You should be sleeping 14 hours a night"
"Mum, even comatose people don't sleep 14 hours a night," says Frank. Only thing though, the whole family matters is given too much spotlight on that the real problem, which is Audrey, is sometimes pushed back to make way for Frank and their mother. Its fun and entertaining to read at first but too much of it is not good. It gets on my skin, really. Within the pages, Audrey comes to know a guy named Linus who soon becomes her boyfriend. They are not Lara Jean and Peter K kinda ‘cute and sweet ‘ but its good enough to make me smile. *Cute Alert* The Coconut Ice Cream scene is SUPER cute !!! And here comes another problem; lets get real here, everyone. Having a boyfriend isnt going to solve any of your illness. Full stop. You cant just go on a lot of cute dates and have a few advise or help given by your boyfriend then BOOM ! No more panic attacks ! No. It bugs me a lot actually when Audrey recovers way too fast. It doesnt seem real. The thing about Audrey’s panic attack is, the cause for why its happened is never revealed. We are a given a few clue but not the whole story. It’s a major plot hole seriously. As a reader, I am not satisfied. WHAT THE HELL HAPPENED SERIOUSLY ? I keep on telling myself to wait but here I am, already on the last page yet Im still clueless. Problem is; I DO MIND. 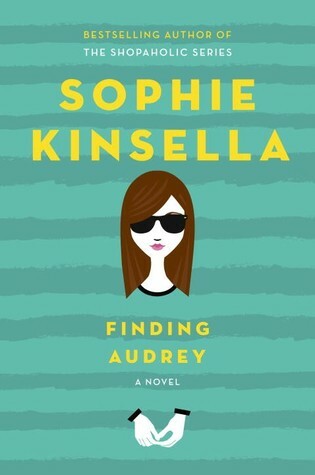 I understand that Kinsella is giving Audrey the upper hand. Like its Audrey’s story so she has the right to not let people know what has happened to her until shes ready (which she never is, considering its never revealed in the book). Yes, some things are better left kept a secret and let it stay in the past, but im afraid this doesn’t fall into that category. And that’s a real bummer.